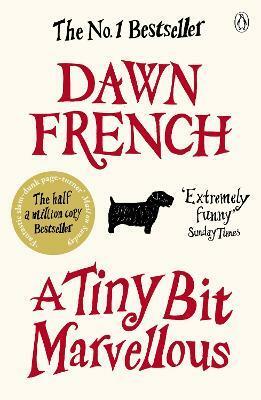 A Tiny Bit Marvellous is comedian Dawn French's hilarious pageturner. Everyone hates the perfect family. So you'll love the Battles. Meet Mo Battle, about to turn 50 and mum to two helpless, hormonal teenagers. There's 17-year-old daughter Dora who blames Mo for, like, EVERYTHING and Peter who believes he's quite simply as darling and marvellous as his hero Oscar Wilde. Somewhere, keeping quiet, is Dad . . . who's just, well... Dad. However, Mo is having a crisis. She's about to do something unusually wild and selfish, which will leave the entire family teetering on the edge of a precipice. Will the family fall? Or will they, when it really matters, be there for each other? A Tiny Bit Marvellous is the number one bestselling novel from one of Britain's favourite comic writers. Dawn French has been making people laugh for 30 years. As a writer, comedian and actor, she has appeared in some of this country's most long-running and celebrated shows, including French and Saunders, The Vicar of Dibley, Jam and Jerusalem, and more recently, Roger and Val Have Just Got In. Her first three novels, A Tiny Bit Marvellous, Oh Dear Silvia and According to YES, are all Sunday Times bestsellers.